BUNCRANA dentist Dr Aneta Spring has been crowned Ulster Regional winner in the Sensodyne Sensitive Dentist of the Year Awards 2016. The prestigious awards, held in Dublin's RDS Concert Hall, invite patients to nominate a dentist if they believe they have gone above and beyond normal patient care in treating patients. Dr Spring, of Spring Dental, Church Street, Buncrana, was nominated by Kathleen H for her "outstanding patience, understanding and professional care" in treating her frightened 10-year old boy. Ms H said in her nomination: “Dr Spring put my son at ease by being caring, professional and friendly and extremely supportive when a trip to the local hospital was required to remove a harmless tumour. 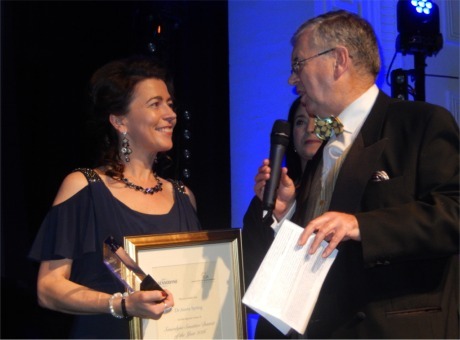 RTE star Joe Duffy interviews Dr Aneta Spring after she was awarded Ulster Regional winner at the Sensodyne Sensitive Dentist of the Year Awards 2016. In choosing the Buncrana-based dental surgeon as regional winner, the judges said that “the care shown to both parent and child was exceptional”. Dr Spring said she was delighted to receive the award. “Last year I was shortlisted and I was delighted, but to receive the award this year for the Ulster region is a huge honour. "It can be very daunting for some children to attend their dentist but I would encourage parents not to put off a visit just because a child is nervous. "Regular check-ups not only ensure that everything is ok but it helps a child to get to know their dentist a little better."